The Kentuckiana Philharmonic Orchestra will be performing works by Claude Debussy, Georges Bizet, and Camille Saint-Saëns. Our music director, Ben Crouch, will be performing the first movement of the Saint-Saëns Cello Concerto No. 1 in A minor. Please join us for our first performance of 2019! We’re looking forward to seeing you all again, and we can’t wait to share some more great music with our community. 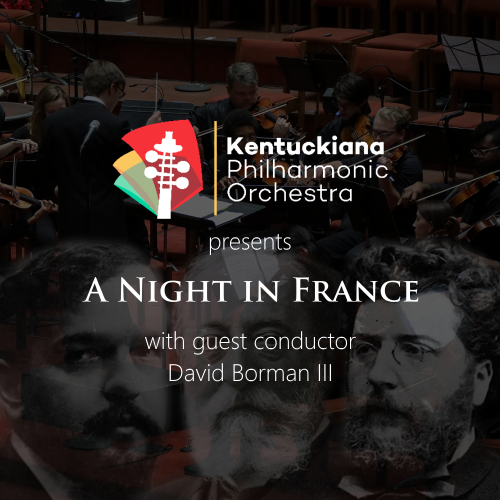 The Kentuckiana Philharmonic Orchestra will be joined by guest conductor, David Borman III. David is currently a student at the University of Louisville, and the Associate Conductor of the Louisville Civic Orchestra. We’re very excited to have him working with us. Tickets are $10 for adults, and $5 for children.